Whilst on a flying visit to Nottingham this weekend I caught the performance of Kindertotenlieder (Songs for dead children) by choreographer/artist Gisèle Vienne, as part of the brilliant nottdance festival. The piece combined aesthetically stunning scenography, live black metal music by KTL (Stephen O’Malley & Peter Rehberg), narrative by Dennis Cooper and alongside human performers, the subtle movement of mechanic teenage sized dolls. Not for the faint hearted, the piece perfectly demonstrated the power of live performance. The work arrested and assaulted the senses in its beauty, dark visions and relentless music, which inhabited the body with intensity of vibration and imagination. Vienne considers the stage as a place to “resuscitate the dead”, a limbic space between dream and reality. Her work and creative skills produce amazing life-size dolls, enabling her to explore the central concept in her work- “the relationship between natural and artificial bodies”. Kindertotenlieder specifically draws on the representation of the body in traditional Austrian iconography and customs like the ‘Perchten’. 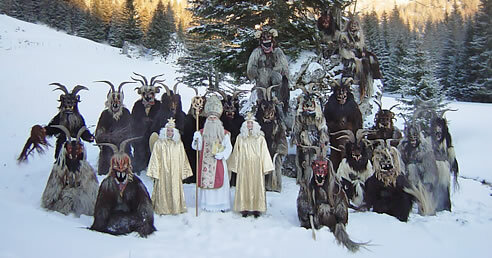 The Perchten (pictured below), two of which terrorized the stage, are creatures who appear mid-winter to offer protection against demons and to punish cursed souls. A custom still alive today, Vienne explores the collision of fantasy, ritual, ceremony and reality. The piece as evident in its contextual references drew intelligently from juxtapositions. These include Feud’s notion of the ‘uncanny’ (something both familiar and alien), as well as dark narratives and violent depictions balanced by beauty and lightness of falling snow. Alongside the snow bringing a magic spectacle to the piece, I also found it to be an interesting device. Through its beauty and deathly silence it dominated the pictorial plane of the stage and physically erased the violent actions which previously unfolded. By no stretch of the imagination was it an easy piece – but more challenging and disturbing in nature. For some members of the audience the show was too much but for me, it re-affirmed the importance of risk taking, the importance of live experiences and a respect for rare imaginative vision. As we venture into space we are not alone!